Berger Paints has launched a social initiative, ‘Easy Clean India’, in an attempt to bring to light the seven most pressing issues that are currently prevailing in the country. The company has developed a dedicated microsite for this initiative where users can vote against these social issues and also share their views on what they would do to eradicate these social issues from the country. The first thing I noticed about the microsite was that it is very user friendly. When I landed on the homepage, a beautiful collage of people who have posted messages welcomed me with a note from the brand which read, “Your Voice can lead the change. Let your voice be heard by the entire nation.” This immediately caught my attention and I was eager to contribute to the huge pool of messages curated from across the country. The brand has invited users to post messages, photos and videos on social media through the website. The landing page introduces the user to all the messages that are already posted by other users in the form of status updates, personalized videos etc. To participate, the users have to keep scrolling and they are made to understand the various findings from the initiative. This gets the users involved in the project and also ensures an increased attention span. 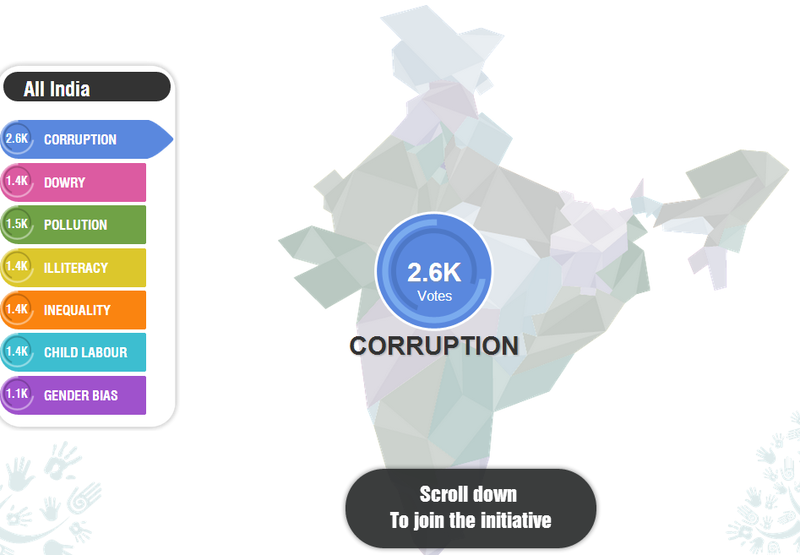 As the users scroll down, they can view how many people have voted for issues across India. At this level, the user is already developing interest. Once the users have got the gist of what the initiative is all about, they are invited to join the initiative by registering themselves. Users are then asked to vote against the social issues they wish to remove from the country. The voting process has been presented in a very interactive way where the users have to click on any of the seven issues they want to clean and, on clicking, a hand wipes off the selected issue & adds it to the ready tweet/update. And the users’ vote gets counted only after they share this message either on Facebook or Twitter. 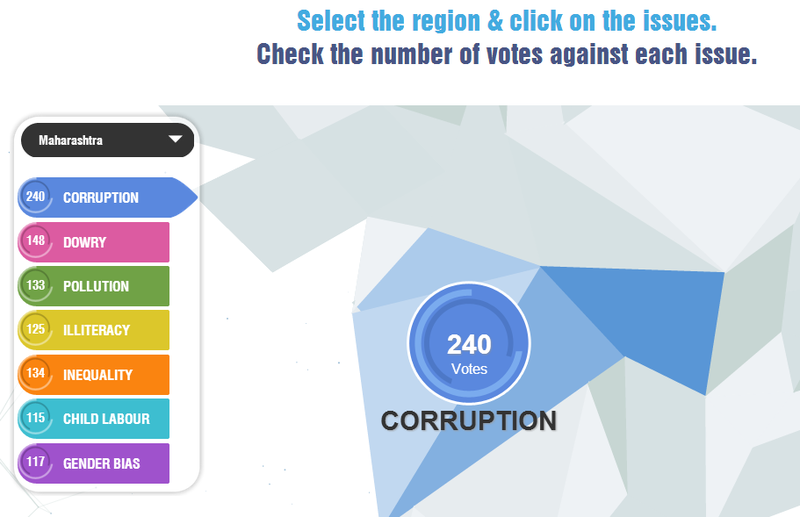 After voting against the issues, users can view state-wise statistics of the votes received on each issue. The interactivity of the platform captures the interest of the user. Additionally, this section also tracks the IP addresses of the users that are used to identify their location, so any user after he/she completes the voting process is initially directed to his/her respective states on the map. Once users reach the last part of the site, they need to choose their way of contribution. They can either ‘Type a Message’ or ‘Share a Photo/Video’. If the user chooses to type a message they can do so on the microsite itself and after typing the message, they can also share it on Twitter or Facebook with a click through the ‘Share on Facebook/Twitter’ social plug-ins. And, if they want to share a photo, they can choose to either upload it directly on the site or they can choose to do it on Twitter, Facebook or Instagram. While for sharing a video, users could do it through Facebook, Instagram or Youtube. By clicking the option to share on social platforms, clear instructions regarding each of them pop up. On Facebook, a tab has been created which is LIKE gated. It is also promoted with various post updates on the brand page. 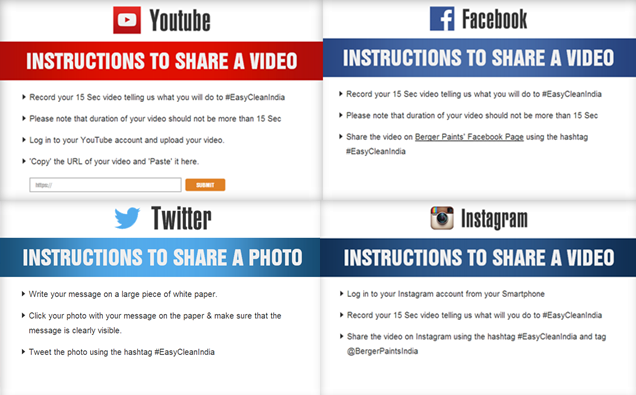 While on Twitter & Instagram, a lot of tweets & updates have gone up with the hashtag #EasyCleanIndia. At the back of my mind, the whole Easy Clean India initiative reminds me of how Berger paints associates with words like beautiful colours, clean, easy to use, way of expression and imagination. This creates such a strong recall value in my mind that I almost forget it’s a brand activity. This kind of recall, which is so seamlessly integrated with the campaign, is more of a sensory engagement. The pretty colors of the message boxes and effective wordings lead to the recognition of brand resonance. The microsite is well laid out and is also responsive which makes it very easy for a user to navigate and achieve what he/she is trying to post, irrespective of whichever device they use to access the microsite. A tweet, post, video or a photo can be passed on to the social platforms in an instant. A single interface website, high visual representations, larger fonts and the colourful approach makes it look larger than life. However, the campaign is very simple from a user perspective. In a day and age where user attention span is minimal, creating easy to use interfaces is a smart marketing strategy. Creating a simple campaign yet such as those which are topical in nature, will result in fulfilling brand objectives of driving conversations and grabbing eyeballs. For a paint company, this is definitely an exciting approach on Social Media. Another very interesting aspect of the entire campaign is the way APIs of Facebook, Twitter and Instagram are integrated with the campaign. When a user uses the hash-tag and tags the brand handle on any social platform, it automatically gets pulled to the back-end of the microsite and as soon as the moderator approves it, gets posted on the site. The process of uploading the photos and videos through the website itself is also made easy. In India, usually people are not as proactive with videos and photos as much as they are with messages; hence, it is essential to make the process as easy as possible. Social Platforms have dedicated application developer centers which have various algorithms. The right kind of APIs can be adopted for brand campaigns. Clubbing social initiatives with brand marketing on social platforms has a great potential to stir conversations. Brands must explore and leverage the use of technology and combine it with an integrated approach, such as #EasyCleanIndia, to effectively market on Social platforms.